The Fellowes 325i is a powerful 5.8mm Strip Cut office shredder that features Fellowes patented SafeSense® Technology, which automatically disables the shredder when hands touch the entry throat. 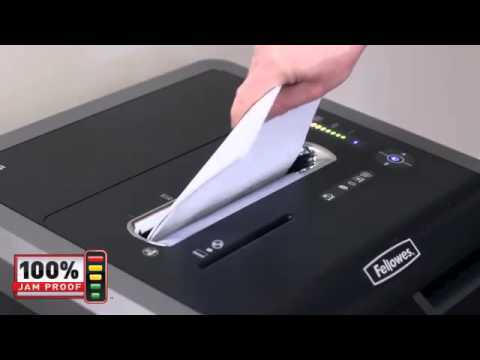 It also features Fellowes 100% Jam Proof technology to eliminate paper jams, as well as an Energy Saving System that reduces in-use energy consumption and that powers the shredder off after a period of inactivity. SilentShred® Technology also minimises noise disruption, making it perfect in a shared work space whilst a continuous duty motor means you can shred all day without having to wait for the motor to cool down. The Fellowes 325i also features an 83 litre plastic pull out bin and can shred staples, paper clips and A4 and A5 paper to Din Level P-2 through the main entry throat. This model also features a separate entry throat that will shred credit cards (to level T-3) and CD's/DVD's (to level O-3). This shredder also features castors for improved mobility, an electronic start/stop feature, auto-reverse in the event of a paper jam and a detachable power cable.